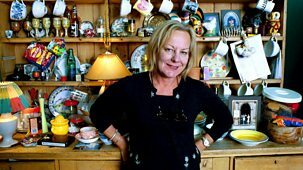 Sue Townsend left school at 14 with no qualifications and in her early twenties was a single mother struggling to feed her three children. A decade later, The Secret Diary of Adrian Mole Aged 13 3/4 was a critical and commercial smash and she had become the best-selling author of her era.\n\nJulie Walters narrates this extraordinary story of a working-class woman who achieved literary stardom through sheer talent and an irrepressible will to write. From Adrian Mole to The Queen & I, Sue Townsend's books combine a brilliantly funny writing style with often biting satire, captivating not just a nation's readers but influencing a generation of writers and performers.\n\nA warm and witty celebration of Sue Townsend's life and writing, the story is told with the help of children from Sue's old school, her friends and family, as well as the comedy and literary stars she inspired - including Stephen Mangan, Ian Hislop, David Nicholls, Isy Suttie and Adrian Scarborough. Drawing on Sue Townsend's own archive of letters and notebooks, the film also features unseen photographs, footage and even her appointment diary, which includes poignant entries about her struggles with ill health, written in a humorous style instantly recognisable from her books.